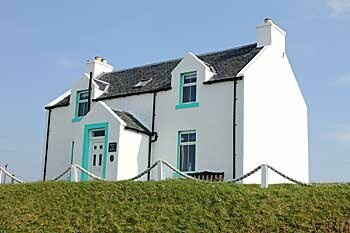 Welcome to Seall na Mara – Your own luxury fisherman’s cottage by the sea. Seall na Mara in gaelic means “A view of the sea” or “Behold! The sea”……and this property certainly lives up to its name. The photo above shows just one view from your property. Check out our photo gallery to see more of the views you can enjoy- and the facilities awaiting you indoors. Situated in the picturesque conservation village of Portnahaven, Seall na Mara is a traditional 80 year old fisherman’s cottage which has been extensively refurbished to provide a contemporary luxury feel. The property benefits from Ocean Views from almost all rooms. Relax in the lounge with Freesat TV, ample books and Board games, free WiFi Internet and MP3 Dockstation. Enjoy the space of a separate Dining Room/Kitchen with brand new units and appliances (Dishwasher, Fridge, Freezer, Microwave). 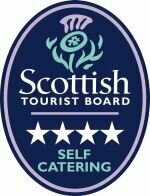 We have official 4* Visit Scotland accreditation and Scottish Tourist Board Category 2 Assisted Wheelchair Access for Residents accreditation. Seall na Mara is fully accessible on the ground floor. With the spacious downstairs wet-room, extra wide doors and a large ground floor king bedroom, less mobile or wheel-chair using guests can enjoy all the wonderful ocean views and amenities. For younger guests there are books, bath toys and beach toys in the large porch area. A travel cot can be arranged on request. Included in the price are free wifi internet access, Electricity, New Oil central heating, Freesat TV, all bedding and towels (excl Beach). Outdoors there is a large elevated private garden to the front and rear with an 8 seater patio table and sunset bench to fully enjoy the spectacular ocean and country views in every direction. 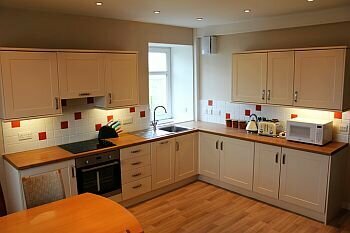 The home is just steps from the lovely child friendly beach, the local well stocked post office and general store…. and a 5 minute stroll to the traditional local pub. The entire ground floor is fully weelchair accessible allowing all guests to enjoy the views and facilities of the home. A welcome basket and local information guide await you on arrival. 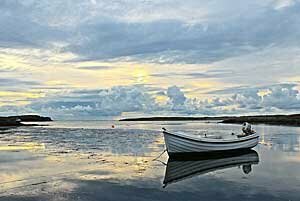 Portnahaven and its neighbouring village of PortWemyss are arguably the most beautiful unspoiled parts of the Island and provide access to a whole range of activities from pottering on the local beaches to cycling, walking, bird-watching, golfing or distillery sampling. Whether you want a family holiday with plenty of space , a relaxing romantic getaway or an active group retreat- the unique atmosphere and facilities of Seall na Mara await you!